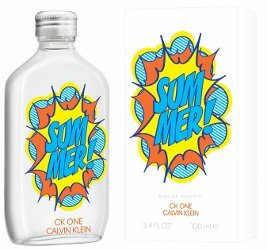 Calvin Klein has launched the 2019 version of CK One Summer, with a pop art theme (including stickers you can use to decorate the bottle). CK One Summer is a flanker to 1994's CK One; you can see last year's model here. Celebrate summer with limited edition CK One Summer 2019. 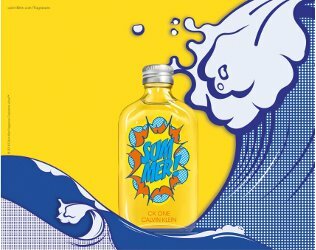 Housed in a vibrant bottle emblazoned with pop art, the new fragrance is bright and refreshing. The energizing scent pairs unexpected Icelandic Blue Lagoon accord and Siberian Driftwood to create a balanced fragrance that epitomizes the essence of summer itself. Additional notes include quince, tangerine, bergamot, waterlily, juniper berries, coriander, matcha tea, musk and blue amber. Calvin Klein CK One Summer 2019 is available as a limited edition 100 ml Eau de Toilette. At last, they’ve heeded my cries! That groovy bottle is calling to me…..and I will happily purchase. Later in the year. At a discount! I like it, although it would be even better with a background color like in the top image!